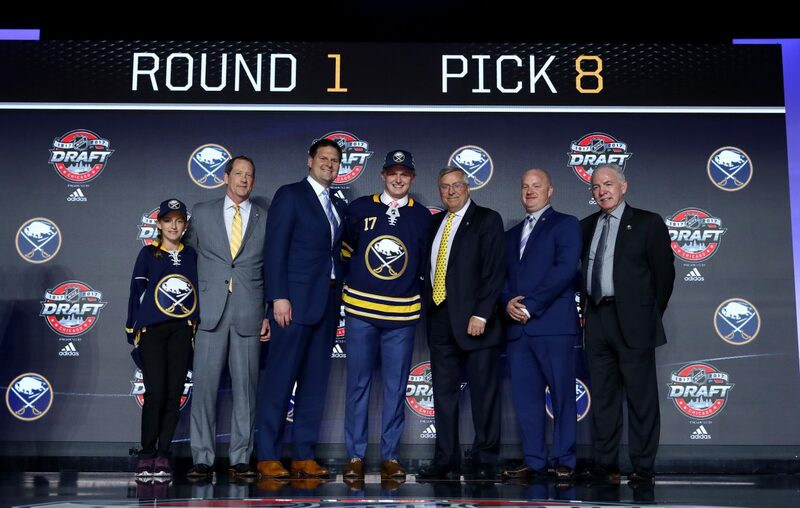 CHICAGO – As the Minnesota high school star walked to the Sabres’ draft table, a former Minnesota high school star was waiting to shake his hand. Casey Mittelstadt’s introduction to Phil Housley and his new team couldn’t have gone any better. It was a surprise meeting. NHL Central Scouting tabbed Mittelstadt as the third-ranked skater in North America, yet the center fell to Buffalo. The 6-foot, 199-pounder split his season between Eden Prairie High School and Green Bay of the United States Hockey League. He excelled in both places. Mittelstadt was voted Minnesota’s Mr. Hockey after putting up 21 goals and 64 points in 25 games. During his last three years at Eden Prairie, he totaled 65 goals and 170 points in 75 games. He started and finished the season with Green Bay, where he led the league with 1.25 points per game. He recorded 13 goals, including four game-winners, and 30 points in 24 outings. 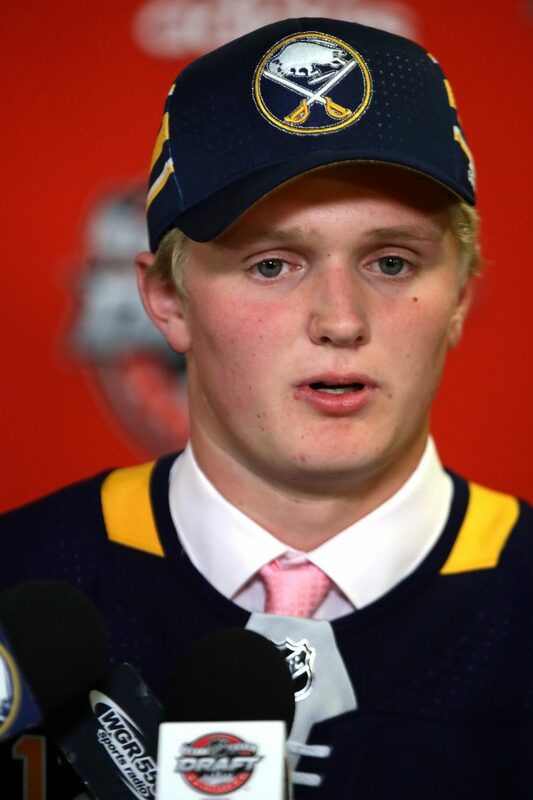 “In high school, sometimes teams had two, three guys on me the whole game,” Mittelstadt said. “Going to Green Bay, I only had one guy on me. It was somewhat of a relief. I enjoyed playing in both spots a lot. "We view him with having a great skill level, plays with pace," Sabres General Manager Jason Botterill said. "We just think he can fit well within our group of dynamic players such as Jack Eichel, Ryan O’Reilly and Sam Reinhart within the next couple years." Mittlestadt’s strength is an issue. He made negative headlines during the NHL Scouting Combine in Buffalo when he failed to do a single pull-up. He also did just one bench-press. "It’s not just Casey, but a lot of kids at the top of the draft this year have amazing skill, but they do have to get physically stronger to play against men and get the net, get to those difficult areas," Botterill said. "And I think just his consistency. He is a high-end player, but just have that compete day in, day out, shift in, shift out. That’s something he can work on." Mittelstadt is heading to the University of Minnesota, which will help his development. At No. 8, Mittelstadt was the highest-drafted American player. The last United States product picked high by Buffalo was Jack Eichel with the second pick in 2015. Though primarily a center, the left-handed shot has spent time on the wing. Scouts say he has an NHL-quality shot and excels at making plays at high speed. Buffalo will find out. He found out about his future home during the combine. “To be picked, me and my family are super excited,” Mittelstadt said. “It’s a huge honor. Obviously, going to a great place like Buffalo makes it even better. We didn’t have much time to explore, but I obviously loved the city right on the lake over there." The Sabres have five picks remaining for the final day of the draft Saturday. They have the sixth and 23rd picks in the second round. They also have a third-, fourth- and seventh-round selection. "We’ll go back right now to the hotel and discuss things a little bit, how the draft unfolded," Botterill said. "There’s certainly some players that we’d love to get in the second round here, but we’ll have discussions with other teams to see how it works out, see if we do put any of those in play, but right now our mindset is that we’ll pick."